There has been significant debate over the use of minimally invasive resection for the management of advanced gastric cancer. Laparoscopic surgery appears as a favorable approach, given the previously reported decrease in postoperative pain, pulmonary complications, and hospital lengths of stay [1, 2]. The reluctance to widely adopt this technique centers on concerns about its oncologic completeness and the complexity of the procedure. Splenic-preserving D2 lymphadenectomy should be performed for appropriate patients undergoing resection for advanced gastric cancer, given the reported decreased locoregional recurrence rates and gastric cancer-related deaths . There are few if any reports on utilizing minimally invasive resection for advanced gastric cancer in Western patients. We have published our preferred technique for laparoscopic distal, subtotal gastrectomy with D2 lymphadenectomy and Billroth II reconstruction for advanced T stage (T3) and/or node-positive disease . In addition, we recently reviewed our results on utilizing laparoscopic total or subtotal gastrectomy with aggressive lymphadenectomy for 28 patients with advanced gastric cancer . 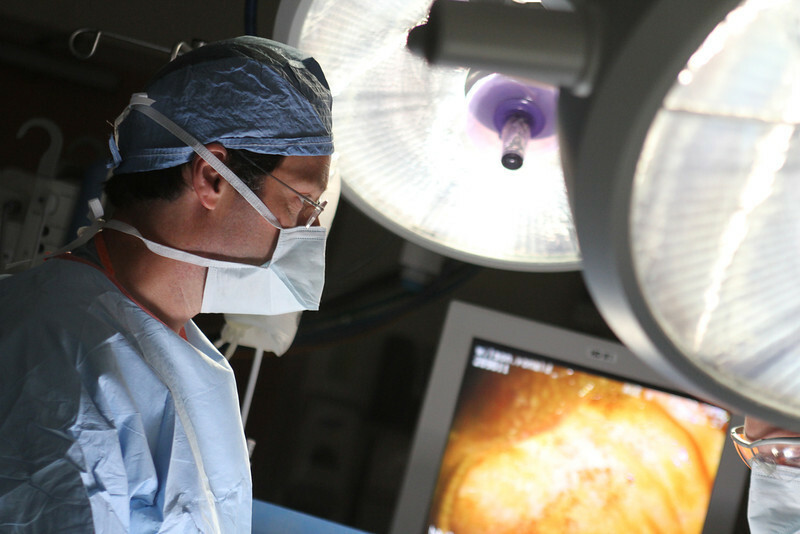 At Roswell Park Cancer Institute, our results in using minimally invasive surgery for advanced gastric cancer demonstrate that the median number of lymph nodes retrieved was 23 and proximal and distal resection margins were negative in all cases. Median length of hospital stay was six days. There was no postoperative mortality in the hospital and morbidity was minimal. Our minimally invasive surgical resection methods are appropriate for the majority of patients presenting with gastric cancer who are candidates for surgical resection. Thus, a minimally invasive surgical approach has become our standard management for both early and advanced gastric cancer. While there is a learning curve associated with the adoption of this procedure, we believe that once adequate technical skills have been developed, its use leads to oncologically acceptable outcomes with superior postoperative recovery. S. Kitano, N. Shiraishi, K. Fujii, K. Yasuda, M. Inomata and Y. Adachi. A randomized controlled trial comparing open vs. laparoscopy-assisted distal gastrectomy for the treatment of early gastric cancer: An interim report. Surgery 131(1 SUPPL. ), pp. S306-S311. 2002. J. -. Lee, H. -. Han and J. -. Lee. A prospective randomized study comparing open vs. laparoscopy-assisted distal gastrectomy in early gastric cancer: Early results. Surg Endosc Interv Tech. 19(2), pp. 168-173. 2005. I. Songun, H. Putter, E. M. K. Kranenbarg, M. Sasako and C. J. H. van de Velde. Surgical treatment of gastric cancer: 15-year follow-up results of the randomised nationwide Dutch D1D2 trial. Lancet Oncol. 11(5), pp. 439-449. 2010. Ben-David, K, Tuttle R, Kukar M, Hochwald SN. Laparoscopic distal, subtotal gastrectomy for advanced gastric cancer. J Gastroint. Surg. Feb;19(2):369-74. 2014. Tuttle R, Ben-David, Hochwald SN. Totally laparoscopic gastrectomy for advanced gastric cancer. Ann Surg Oncol. Submitted. 2015.